ABS. (1997). National Nutrition Survey: Selected highlights Australia 1995. Canberra: Australian Bureau of Statistics. ABS. (2008). Census of Population and Housing: Socio-Economic Indexes for Areas (SEIFA), cat. 2033.0.55.001. Retrieved April 20, 2012, from http://www.abs.gov.au/AUSSTATS/abs@.nsf/DetailsPage/2033.0.55.0012006?OpenDocument Adams, D. (2009). A social inclusion strategy for Tasmania. Retrieved 5 August, 2010, from http://www.dpac.tas.gov.au/divisions/siu Apparicio, P., Cloutier, M. S., & Shearmur, R. (2007). The case of Montreal's missing food deserts: Evaluation of accessibility to food supermarkets. International Journal of Health Geographics, 6, -. doi: Artn 4 Doi 10.1186/1476-072x-6-4 Australian Institute of Health and Welfare. (2010). Australia's Health 2010 - The twelfth biennial health report of the Australian Institute of Health and Welfare Retrieved 20 September, 2011, from www.aihw.gov.au/WorkArea/DownloadAsset.aspx?id=6442452962 Azuma, A. M., Gilliland, S., Vallianatos, M., & Gottlieb, R. (2010). Food Access, Availability, and Affordability in 3 Los Angeles Communities, Project CAFE, 2004-2006. Preventing Chronic Disease, 7(2), 1-9. Barrett, C. B. (2010). Measuring Food Insecurity. Science, 327, 825-828. Begg, S., Vos, T., Barker, B., & et al. (2007). The Burden of Disease and Injury in Australia. Canberra: AIHW. Bodor, J. N., Rose, D., Farley, T. A., Swalm, C., & Scott, S. K. (2008). Neighbourhood fruit and vegetable availability and consumption: the role of small food stores in an urban environment. Public Health Nutr, 11(4), 413-420. doi: S1368980007000493 [pii]10.1017/S1368980007000493 Burns, C. (2004). A review of the literature describing the link between poverty, food insecurity and obesity with specific reference to Australia. Victoria: Victorian Health Promotion Foundation. Burns, C., Jones, S. J., & Frongillo, E. A. (2010). Poverty, household food insecurity and obesity in children. Preventing Childhood Obesity: Evidence Policy and Practice, 16, 129-137. Burns, C. M., Gibbon, B., Boak, R., Baudinette, S., & Dunbar, J. A. (2004). Food cost and availability in a rural setting in Australia. Rural and Remote Health, 4(311). Cambell, C. C. (1991). Food Insecurity: A Nutritional Outcome or a Predictor Variable? The Journal of Nutrition, 408-415. Carlson, A., & Gerrior, S. (2006). Food source makes a difference in diet quality. J Nutr Educ Behav, 38(4), 238-243. doi: S1499-4046(06)00342-3 [pii] 10.1016/j.jneb.2006.04.148 Chown, P., Kang, M., Sanci, L., Newnham, V., & Bennett, D. L. (2008). Adolescent Health: Enhancing the skills of General Practitioners in caring for young people from culturally diverse backgrounds, GP Resource Kit 2nd Edition. Sydney: NSW Centre for the Advancement of Adolescent Health and Transcultural Mental Health Centre. Dean, W. R., Sharkey, J. R., & Johnson, C. M. (2011). Food insecurity is associated with social capital, perceived personal disparity, and partnership status among older and senior adults in a largely rural area of central Texas. Journal of Nutrition in Gerantology & Geriatrics, 30, 169-186. DEEWR. (2011). Small area labour markets Australia - December quarter 2011 Retrieved April 20, 2012, from http://www.deewr.gov.au/Employment/LMI/Documents/SALM_Dec2011.pdf Delivering a Healthy Western Australia. (2010). Food Access and Costs Survey (FACS) Retrieved 20 September, 2011, from http://www.public.health.wa.gov.au/cproot/4115/2/Food%20Access%20and%20Costs%20Survey%202010.pdf Delormier, T., Frohlich, K. L., & Potvin, L. (2009). Food and eating as social practiceunderstanding eating patterns as social phenomena and implications for public health. Sociology of Health & Illness, 31, 215-228. Department of Treasury and Finance. (2005). Long-Term Unemployment in Tasmania: A Statistical Analysis. Tasmania: Department of Treasury and Finance. Department of Treasury and Finance. (2011). Long-term unemployment - December 2011 Retrieved April 20, 2012, from http://www.treasury.tas.gov.au/domino/dtf/dtf.nsf/LookupFiles/Long-Term-Unemployment.pdf/$file/Long-Term-Unemployment.pdf FAO. (1996). Rome Declaration on World Food Security and World Food Summit Plan of Action. Rome. FAO. (2008). An introduction to the basic concepts of food security Retrieved February 2012, from http://www.fao.org/docrep/013/al936e/al936e00.pdf Flanagan, K. (2010). Hard times: Tasmanians in financial crisis. Hobart: Social Action and Research Center, Anglicare Tasmania Gleeson, B., & Carmichael, C. (2001). Responding to regional disadvantage: What can be learned from the overseas experience? Sydney: Australian Housing and Urban Research Institute. Gleeson, B., & Randolph, B. (2000). Social Disadvantage and Planning in the Sydney Context. Sydney: NSW Department of Urban Affairs and Planning. Gorton, D., Bullen, C. R., & Mhurchu, C. N. (2009). Environmental influences on food security in high-income countries. Nutrition Reviews, 68(1), 1-29. Hamelin, A.-M., Habicht, J.-P., & Beaudry, M. (1999). Food Insecurity: Consequences for the Household and Broader Social Implications. The Journal of Nutrition, 525S-528S. Health Workforce Queensland. (n.d.). RRMA/ASGC-RA Town/Postcode Search Retrieved 18 January, 2012, from http://www.healthworkforce.com.au/main_rrma.asp Kolodinsky, J., Harvey-Berino, J. R., Berlin, L., Johnson, R. K., & Reynolds, T. W. (2007). Knowledge of Current Dietary Guidelines and Food Choice by College Students: Better Eaters Have Higher Knowledge of Dietary Guidance. Journal of the American Dietetic Association, 107(8), 1409-1413. Locher, J. L., Yoels, W. C., Maurer, D., & Vanells, J. (2005). Comfort foods: An exploratory journey into the social and emotional significance of food. Food and Foodways, 13, 273-297. Lupton, D. (1994). Food, memory and meaning: the symbolic and social nature offood events. Sociological Review, 42, 664-685. Madden, K. (2003). Blue collared: The shrinking world of work in Tasmania. Hobart: Social Action and Research Centre, Anglicare Tasmania. Madden, K. (2004). Bread and Board: when the basics break the budget. Hobart: Social Action and Research Centre, Anglicare Tasmania. Madden, K., & Law, M. (2005). The Tasmanian community survey: Finacial hardship. Tasmania: Tasmanian Anglicare. McCluskey, K. (2009). Food security in Moreland: A needs assessment. Melbourne: Merri Community Health Services. McCormack, J. (2010). Regional employment plan Retrieved 17 February, 2011, from http://www.keepaustraliaworking.gov.au/documents/PDFs_RTFs/north-west_northern_tas_rep.pdf Meedeniya, J., Smith, A., & Carter, P. (2000). Food Supply in Rural South Australia: A Survey on Food Cost, Quality and Variety. South Australia: Eat Well SA. National Health and Medical Research Council. (2003). Dietary Guidelines for Australians. Canberra: Australian Government Publishing Services. Neville, I. (2011). Overview of the North West/Northern Tasmania Priority Employment Area Retrieved April 20, 2012, from http://www.deewr.gov.au/Employment/LMI/RegionalReports/TAS/Documents/July_2011_LAUNCESTON.pdf Nord, M., Andrews, M., & Carlson, S. (2007). Measuring Food Security in the United States: Household Food Security in the United States, 2005. Economic Research Report No. 29. Washington, D.C.: USDA Economic Research Service. Northern Territory Government. (2008). NT Market Basket Survey 2008. Northern Territory: Department of Health and Family, Northen Territory Government NSW Health. (2002). New South Wales Child Health Survey 2001. Retrieved 20 September, 2011, from http://www.health.nsw.gov.au/pubs/2002/pdf/nswchildhealthsurvey.pdf PMSEIC. (2010). Australia and Food Security in a Changing World. Canberra, Australia: The Prime Minister�s Science, Engineering and Innovation Council. Queensland Health Treasury. (2000). The Healthy Food Access Basket Survey 2000. Queensland Queensland Health Treasury. Queensland Health Treasury. (2006). The 2006 Health Food Access Basket survey Retrieved 08 August, 2011, from http://www.health.qld.gov.au/ph/documents/hpu/33125.pdf Rose, D. (1999). Economic determinants and dietary consequences of food insecurity in the United States. Journal of Nutrition, 129, 517s-520s. Russell, D. G., Parnell, W. R., Wilson, N. C., & et al. (1999). NZ Food: NZ People. Key Results of the 1997 National Nutrition Survey. Wellington: Ministry of Health. Rychetnik, L., Webb, K., Story, L., & Katz, T. (2003). Food Security Options Paper: A food security planning framework: A menu of options for policy and planning interventions: NSW Centre for Public Health Nutrition, NSW. Schubert, L., Gallegos, D., Foley, W., & Harrison, C. (2011). Re-imagining the 'social' in the nutrition sciences. Public Health Nutrition, f1-8. Strategic Inter-Governmental Nutrition Alliance (SIGNAL). (2000). Eat Well Australia: An Agenda for Action for Public Health Nutrition. Melbourne: National Public Health Partnership. Tasmanian Government. (2004). Tasmanian Food & Nutrition Policy 2004 Retrieved 28 March, 2010, from http://www.dhhs.tas.gov.au/__data/assets/pdf_file/0014/34601/TFNP_final.pdf VicHealth. (2005). Healthy Eating - Food Security. Investment Plan 2005-2010. Melbourne: VicHealth. VicHealth. (2007). Food Security Fact Sheet. Melbourne: VicHealth. Vozoris, N., Davis, B., & Tarasuk, V. (2002). The affordability of a nutritious diet for households on welfare in Toronto. Canadian Journal of Public Health, 93(1), 36-40. WHO Commission on Social Determinants of Health. (2007). Achieving health equity: From root causes to fair outcomes. Geneva: WHO. Williams, P. G. (2010). 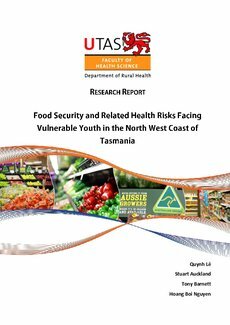 Monitoring the affordability of healthy eating: a case study of 10 years of the Illawarra Healthy Food Basket. Nutrients, 2(1), 1132-1140.